Reports Tuesday indicated that the Cincinnati Bengals want a first-round pick, “at least,” in trade return for their backup quarterback, AJ McCarron. McCarron has played more competitive NFL snaps than fellow backup-come-would-be-trade-bait quarterback Jimmy Garoppolo (341 versus 228) with the New England Patriots, so perhaps the Bengals are wise to not be keen to let him leave cheaply. A poor playoff showing against the Pittsburgh Steelers in 2016 put a dent in any hype for McCarron, after three solid starts from Weeks 15 to 17. 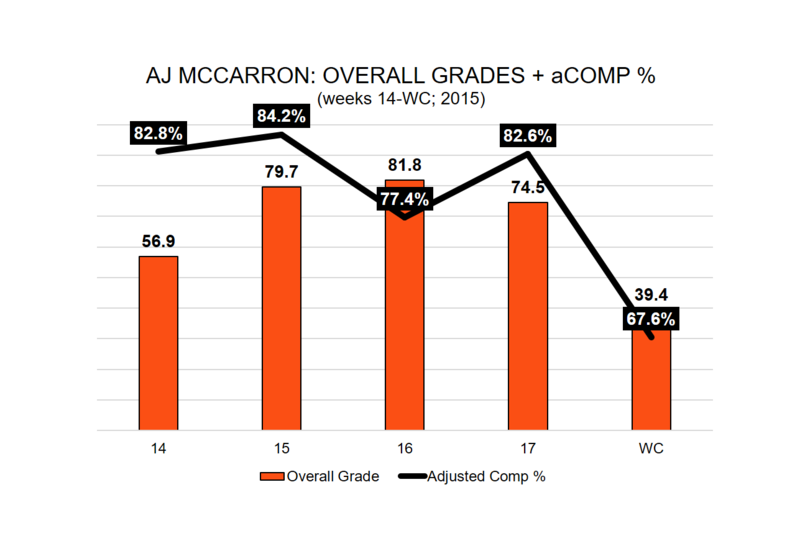 Over the final four weeks of the regular season, McCarron ranked second in the NFL with an adjusted completion percentage of 81.4 percent, but like his grade, that took a serious hit in the playoff game against the Steelers. He struggled throwing the ball downfield in 2015, completing just nine of the 24 passes traveling 20-plus yards in the air, but impressed in the 10- to 19-yard range, where he went 18-for-23 with four touchdowns and no interceptions.